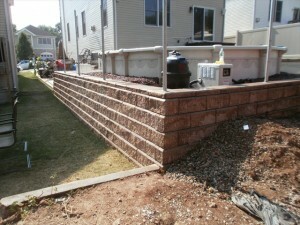 Advanced Site Contractors builds structural and decorative retaining walls in Staten Island, Brooklyn, Manhattan, and throughout Central and Northern NJ for both residential and commercial properties. Whether you need a retaining wall to handle sloping issues, drainage issues or erosion issues, or you simply want to enhance the decorative look of your outdoor space by adding dimension and depth, we can custom design and build retaining walls to meet your needs. Our professional contractors have been building retaining walls in the area for many years and are experienced in utilizing all types of materials to create retaining walls that are not only functional but aesthetically pleasing. Additionally, we are experienced in site drainage, as well as excavating and grading, so we can handle all aspects of the project. Our landscape design services can also help you create appropriate landscaping on and around retaining walls to complete your desired landscape look. Need a Retaining Wall? Contact Us Today! For more information about retaining wall construction in Staten Island, Brooklyn, Manhattan, Northern NJ or Central NJ, call us today at (718) 984-7483. If you prefer, you can contact us by filling out the form on the side of this page and we will get back to you.